Mercury conjunct Pluto natal gives a powerful intellect and deep curiosity. You can be a very intense person and this will especially show in your style of communication. You can have a strong influence on those around you and be very persuasive, with a penetrating stare. Many people can be influenced by your powerful words. You are so persuasive because you know the facts on a particular matter. Your probing mind can uncover all the details and those things that are hidden. You also have the ability to understand occult meaning or mysteries, that only a very few people are able to reach and understand. You would make an excellent detective or researcher. But it is you ability to relate your knowledge to others that makes you a good all round communicator. People will be impressed by your depth of understanding and therefore come around to your way of thinking. 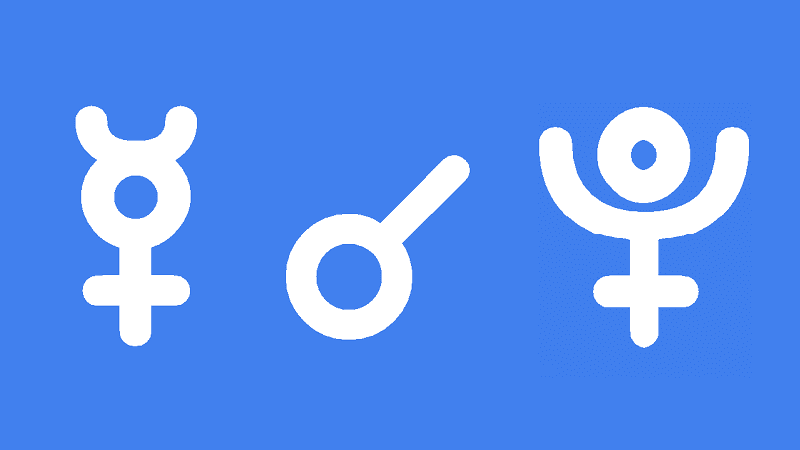 Natal mercury conjunct Pluto is neutral for good and bad. You also have the ability to convince other of lies. You would be good at keeping secrets and spreading propaganda. Obviously, a career in communications would suit but so would the secret service or even in underworld organizations. You can be quite forceful when communicating and this may pose a problem with close relationships. It is possible that you friends find you interfering at times or too intense. Learning to relax is important because you can very easily become highly strung and may suffer from nervous conditions. You will likely become involved in some dark and very serious issues in your life, possible relating to addiction or abuse. But you have the intellect and psychological understanding to see the bigger picture, the interrelatedness of everything in the universe. This spiritual view helps you continually evolve your thinking to transcend the limitations of life in a finite human body. Mercury conjunct Pluto transit adds depth and intensity to your thinking and communications. This is a good time to get to the bottom of troubling issues. You can uncover secrets through study and research, or through probing and questioning others. You can more easily gain a thorough understanding of mysteries and occult subjects like astrology. Psychological self-analysis is favored. This would be an excellent time to visit a counselor or to gain greater understanding of the relationships dynamics of a partnership you are involved in. On the other hand, you can also use your mental powers to deceive others. You have great power of persuasion and can influence other people. You can share spiritual truths just as easily as spreading propaganda. It is likely you will be more interested in serious subjects, and may become involved in the darker side of life through criminality or addiction. Power struggles are possible at the intellectual level, and this could involve thought projection and other non verbal ways of psyching people out. Nervous conditions are possible due to the intensity of your mind and the serious nature of the topics you may unearth. It is also possible that other people will find you too overbearing or interfering, as if you are staring into their soul. Your power to influence can make others feel threatened. Relaxing will be important if you do find the intensity too much. It is possible to make profound discoveries during this transit. You may discover something very revealing about yourself, from deep within your soul. This may include spiritual links with ancestors and could lead to a spiritual transformation or sensation of transcending the physical limitations of your body. River Phoenix 0°04′, Friedrich Steuben 0°12′, Jimmy Connors 0°15′, Sylvester Stallone 0°19′, James Stirling 0°19′, Leon Gambetta 0°20′, Sydney Pollack 0°24′, Claudia Schiffer 0°40′, Harry S. Truman 0°42′, George W. Bush 0°45′, Whitney Houston 0°45′, Galilei Galileo 0°54′, Charles Baudelaire 1°11′, Sarah Schulman 1°14′, Della Reese 1°24′, Philippe Petain 1°29′, Bon Scott 1°58′, Arthur Conan Doyle 2°11′, Bill Cosby 2°59′. I have a tight stellium of mercury, Pluto and Jupiter which I believe holds the keys for me to truly understand my life and it’s path. Any comments you could share on this? I find it to be a very complex aspect to understand at times. Hello Kodiaq, it may help once I have written about the other conjunctions. I would think you have an amazing intellect that is curious to know everything. A wide and comprehensive knowledge but you would also research very deeply on whatever you are obsessed with at any one time. Others may find you full on at times with relationships. You may need to learn to ease off if you sense them backing off. They may feel they have to prectect their privacy or that you are too probing. Just a quick feedback: On the 19th I felt that someone was too overbearing or interfering in his communications.. like saying up to you but do it on my way .. that’s quite plutonian, isn’t it? Definitely, probing, piercing, meddling. The Inquisition. Hi Jamie–enjoy reading your insights immensely– I have the Pluto/Merc conjunction along with Uranus and the Sun within 14 degrees of each other centered around my 18 degree Virgo Asc (I know, right? Yeash). Lots of horsepower but no where to go. Very scattered in multiple directions–and if I don’t exercise and eat right my Sat/Moon partile conjuction in the 6th gets the best of me! I love Astrology with a Mundane focus (not a people person as you can imagine-the idea of talking to someone about their inner life makes me want to puke) and as a vocation I am a master heavy truck mechanic with 35 years in. Anyway I’ll end it with Tr Pluto trining my natal Pluto (THAT doesn’t happen to most generations–Pluto has been hauling the last couple decades!) Lots of change in how I view learning and deciding whats important and what isn’t. God Bless and thank you for all the information on your site! Hi Kevin, the current eclipse cycle is incredibly important for you. The September 2015 solar eclipse at 20°10′ Virgo was very close to your Ascendant. You should be able to use your mind power to gain better focus I would think. That powerful mind of your is even more powerful with the fixed star Asterion rising. You may have been struggling this last few weeks though, a turning point with the December new moon square your AC. All the best, I have Jupiter at 19 Virgo. I was born on 25/09/1968, 4 days after you. I too have the same yod as you with Saturn at the apex inconjuct Pluto sextile Neptune opposed by mercury & Venus. My Jupiter is at 19Virgo53 conjunct Pluto at 23Vir01. Jupiter is at present conjunct this conjunction. But I’ve not had any luck in finding a job for the past 1 month or so. Why is that and what are my chances of finding one soon. Also Uranus is approaching to conjunct our focal point Saturn in 3-4 months. So what will it’s effect be. My Saturn is in the 4th house. Hi astro brother. I am really unsure about Uranus on Saturn expect that we are in for some relative massive changes in your responsibilities and duties. Perhaps more freedom from such responsibilities but I do feel a little scared by it all. Also Saturn in 4th. I’m sure better luck will come once Jupiter has turned direct again. See my Jupiter retrograde post. Be sure to stay in touch over coming years so we can compare notes. Kevin, my chart sounds very similar to yours. I, too, have Pluto/Merc conjunction, along with Uranus and the Sun (a few degrees apart – all in the 12th house Virgo – Virgo ascendant also) opposite a Moon-Saturn conjunction (1 degree apart) in the 6th (Pisces). I wasn’t aware that Pluto had been twining my natal Pluto back in 2016 (2016-2017 were some of the most difficult years of my life). If George w bush has this conjunction, there must be something huge happening elsewhere in his chart that makes him appear so dumb. With Mercury Pluto I’d expect him to be more intense not more dense. Some of the others there could fall into the same category too. This is today and already found myself deeply and profoundly moved by the news of Sir John Hurts passing, akin to the loss of a very dear close friend whom I hadnt met and now wont, yet I hadnt realised I even needed to or felt that way, as much as I have found great depth in his many brilliant perfomances over his 60 years devoted to his art, quite strange, even for me lol! Hi! If natal venus is in opposition to this conjunction, what’s the influence? Could it add intensity on emotional or money matters? Thanks! The practical mind in contact with the mysterious superconscious.A very resourceful mind to say the least.John Nash had this conjunction in Pisces in the 12th. Correction in cancer in the 12th. I would recommend watching the movie ‘ a beautiful mind ‘again if you’ve seen it already.I think it would be interesting for people to see it from an astrological perspective after plugging this info in and observing how his mind works. Here’s an interesting one : Alex Honnold ; mercury retrograde conjunct mars in leo.He has Jupiter in opposition in Aquarius.Uranus it’s ruling planet in Saggitarius opposite Chiron in gemini. Hmmm.? The retro merc.no doubt contributes to his unique rock climbing abilities.the oppositions look challenging birthdate : August 17th 1985.